A new annex becomes a hands-on experience in preservation and urban design policy that garners neighborhood groups and local preservationists approval. 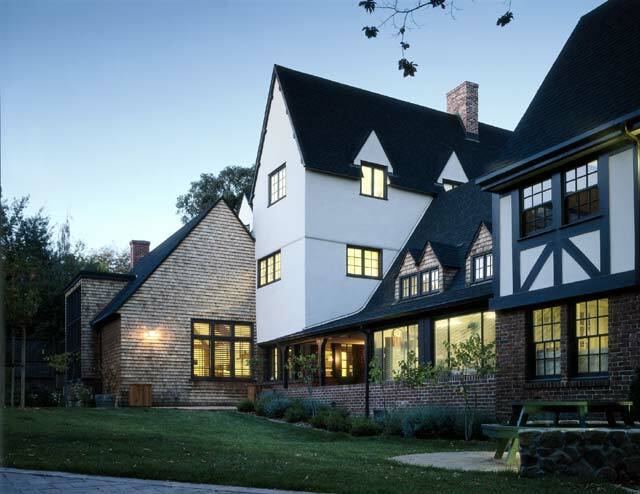 Architects often struggle with making contemporary statements that respect older traditions. They argue over whether their designs should speak to earlier buildings directly, indirectly, or not at all. Communities that have lost historic buildings that were significant either because of exceptional architecture (Penn Station, for example) or popular sentiment (a favorite ice cream parlor) are concerned about the loss of historic places and the addition of monstrosities that erase collective memory. For projects at the University of California, Berkeley, in a town of particularly outspoken citizens, the potential exists for an architect’s nightmare – a project buried by committee. Over a century ago, an iconoclastic architect named Ernest Coxhead came to California from England to experiment with combining forms and materials in unexpected ways. 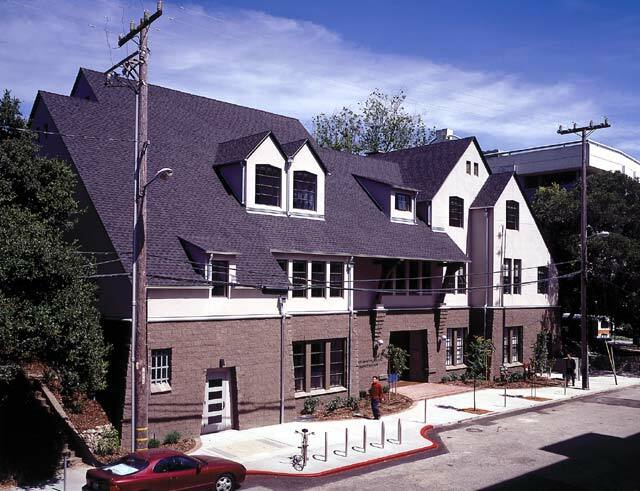 An early commission in the Bay Area was a fraternity house on the north side of the campus of the University of California. He designed the large house so it appeared to be several smaller structures, a sort of European village. Back then, the town actually felt something more like the countryside. Over the years, a large number of professors populated the neighborhood. 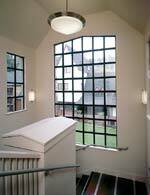 Residential structures by early Bay Region architects such as Bernard Maybeck and John Galen Howard dotted the hills. Most of the fraternities ended up on the southeastern edge of the campus, and in the late 1960s the School of Public Policy took up residence in Coxhead’s quirky structure. 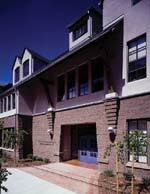 By the middle 1990s, the nationally recognized school needed to upgrade their beloved house and began a program of expansion. Architectural Resources Group (ARG), a San Francisco firm with a specialty in historic preservation, was hired to upgrade the landmark structure to meet current codes, including seismic strengthening. Over the years, Coxhead’s unusual design had become a little more mixed up, but ARG’s approach left the earlier renovations largely intact. However, as part of the code upgrade project, the design team proposed that the school develop a master plan for the site. 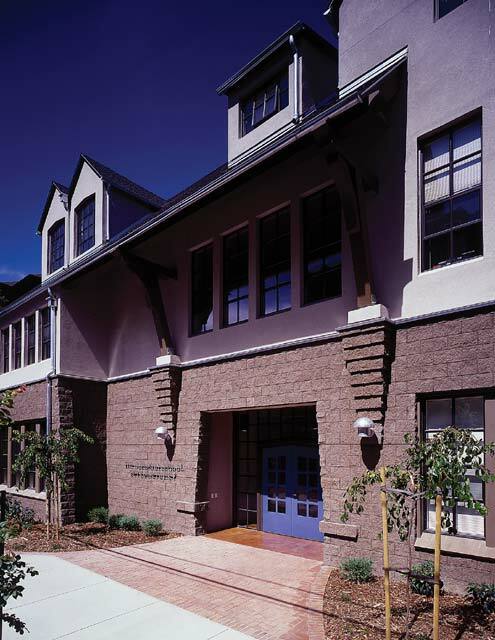 It turned out that the school had already envisioned a master plan, which ARG helped to complete, involving an upgrade of the school’s physical facility and the design of a new building. 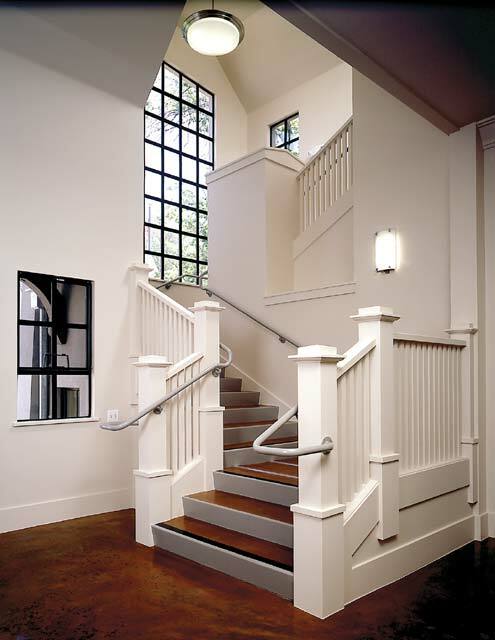 In the process of renovating Coxhead’s building, the architects had learned how it was put together and how the school worked. 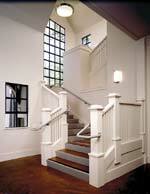 Their sensitivity to the historic and cultural aspects helped them develop a compatible design for the annex. One of the largest sources of tension was the relationship between the university and the community and preservation activists. Local opinion ranged from concerns over the architectural expression to resistance to any new campus structure. 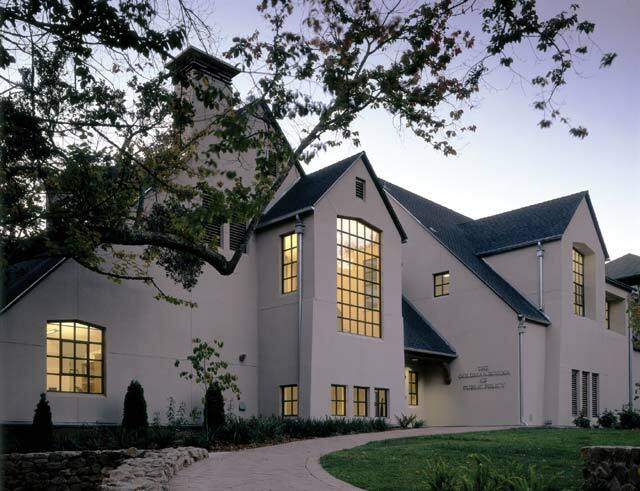 The Goldman School was in the unusual position of applying their teaching to expanding their facility on campus. Judd continues, “The school trains students to understand public policy. In this case, preservation and urban design policy had to be broadly understood in order to bring the community on board. 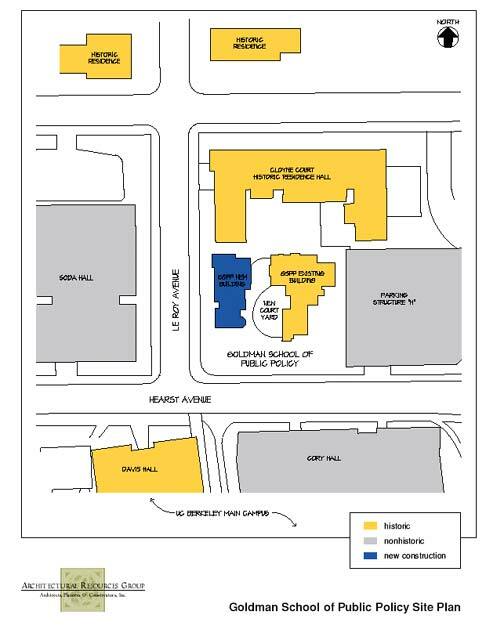 As the School of Public Policy, they didn’t want to be the bully.” Only a surface parking lot occupied the site of the proposed new structure, so no buildings had to be demolished. But the always-vigilant Berkeley preservation community expressed a lot of doubt. After many meetings with neighborhood groups and local preservationists, a winning design emerged and threatened litigation was withdrawn. But the process took several iterations. Inside this quiet building are octagonal classrooms designed to encourage lively dialog. According to Michael O’Hare, a professor at the Goldman School, who originally trained as an architect and engineer and collaborated with ARG on the design, “Our students are socialized to expect one-way interaction with a professor. The professor knows true things and tells them, and then they write it down.” In contrast, the instruction at the Goldman School is highly interactive and case-based. The students are given problems and resources to work on together. According to O’Hare, “The students need to see each other’s faces and know each other’s names.” This is the reason for the tiered design, the slots for name cards, and the egg-shaped seating arrangement. 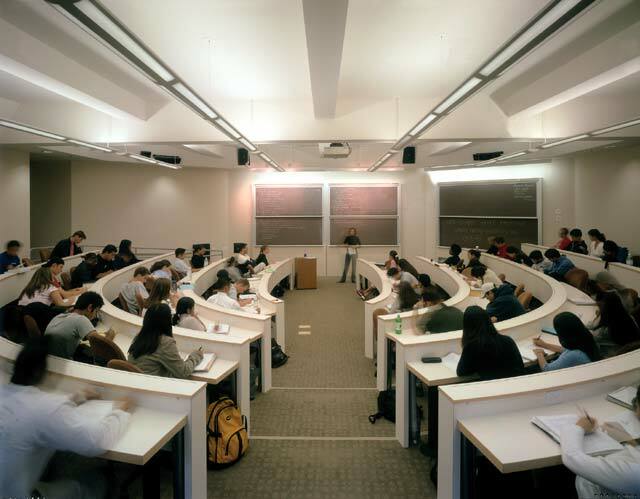 O’Hare expects the classrooms to reinforce the schools preferred teaching style and help students adapt quickly and use it productively: “The architecture is especially important to overcome the habit of being told stuff in a lecture arrangement.” Certain traditional tools of classroom design, such as a blackboard and screen, are placed at the open end or front of the classroom. Judd comments, “It is a wonderful irony that we ended up with a building that is fairly subdued on the outside, but encourages lively debate on the inside.” In addition to two large classrooms that can hold over 100 students each, there are 12 faculty offices, as well as computer labs. The school also wanted some kind of center, or heart, where debate could be fostered. Building the new structure at the site’s western edge permitted a new courtyard to be constructed between the historic and new buildings. In Berkeley’s moderate climate, this outdoor space is now used for classes, special events, and the spontaneous interaction that is essential to campus life. Judd, who went to school at UC Berkeley, remembers, “Even though several large buildings interrupted the original campus plan, there are dozens of delightful spaces under a tree where you could study, nap, or argue. Respecting the landscape tradition is as important as respecting Coxhead’s architectural tradition. Most importantly, we engaged in a lively public debate to get here. Another fine Berkeley tradition!” Sometimes a lot of noise results in something quite subtle and wonderfully familiar. 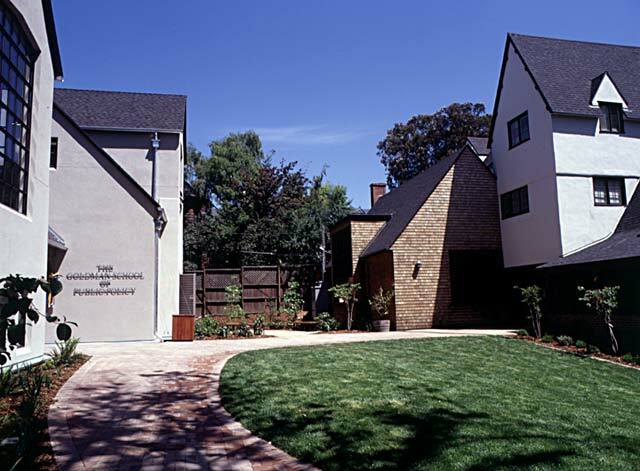 Architectural Resources Group, Architects, Planners & Conservators, Inc., is a San Francisco-based architecture and historic preservation firm founded in 1980. 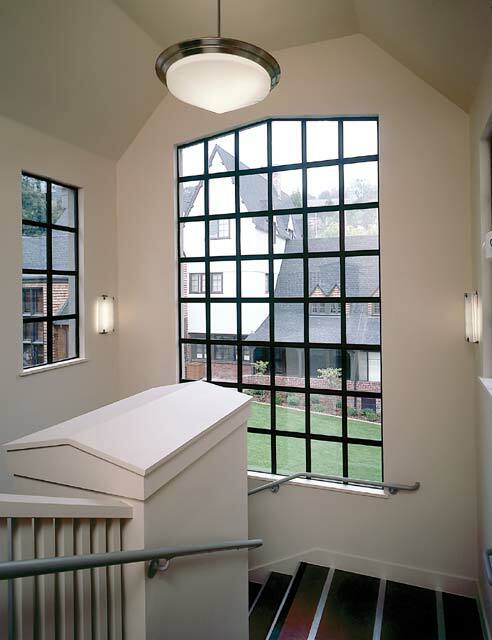 The firm had been responsible for the adaptive reuse and seismic strengthening of existing structures, the documentation and restoration of historic properties, and the design of new structures that fit into historic surroundings. Well known projects include the Conservatory of Flowers in San Francisco's Golden Gate Park, the Filoli Estate and Visitor's Center in Woodside, and the Language Center at Stanford University. Kenneth Caldwell is a communications consultant and writer based in Oakland, California. 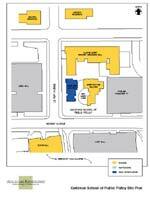 The existing (quirky) Ernest Coxhead-designed building faces the new annex across a courtyard. The courtyard connecting the two buildings used to be a parking lot. Tiered oval-shaped classrooms create an interactive, collaborative learning environment.